Join us for our monthly Tea with Amber Chat Room and keep abreast of the most current issues. Temporarily adopt United States servicemen's or servicewomen's pets while they are deployed. Discounts provided for Military personnel and senior citizens. 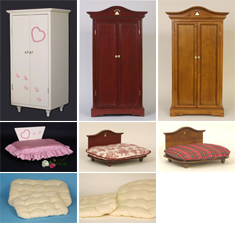 Amber's Armoire does not use genuine fur, leather or feathers in their products. Here, at Amber's ArmoireTM, we can never get enough good advice on caring for our pets. From the latest medical breakthroughs to quick and easy grooming tips, we try to provide our customers with the most current information on making their lives and their pet's lives more comfortable. Please note the categories we have listed below for helpful information. Keep referring to this page as we are always adding new categories. As most of you realize, the dedicated pet owner/guardian has a tendency to humanize their pets. And rightly so, since pets are and should be considered part of the family. Sometimes, we let our motherly or fatherly instincts get the best of us when viewing pets as our "children". Please remember that dogs and cats, with the exception of some, have their natural coats to keep them warm in the winter and insulated in the summer. A little common sense can do wonders. For example, the origin of a hairless Chihuahua began in a very hot Mexican climate. However, through the ages, many of these dogs have been transported to areas all over the world, including very cold climates. They are ideal candidates for clothing. On the other hand, Alaskan Eskimo dogs, obviously created for cold climates, are living in tropical areas and therefore need not wear clothing. Your "child" will let you know when or if he/she wants to be dressed. Below are some do's and don'ts when making the decision whether or not to dress your pet. If they are hairless, short-haired or mid-haired or have a long, thin coat. By slowly breaking them in little by little. Try to combine their coat or sweater along with their leash when taking them for a walk, shopping or other social functions. They will gradually get the idea and will associate the clothes with a good time. If you live in a cold climate where they will be outside for a lengthy duration of time or live in doghouses (which we do not advise as this may cause joint pain such as arthritis and other medical problems, just as in humans, your pet should NEVER be left out in cold weather). When shopping during cool weather, but if you plan to stay in a store for a while, your pet may become overheated, so remember to loosen, unbutton, unzip or remove the clothing during that time. During cool summer evenings, but only in a very lightweight t-shirt. Only if they enjoy wearing the clothes. If you live in a hot climate where temperatures exceed the norm. Doing so may cause your pet to encounter heat stroke. If they have a full, thick, dense coat. In tight clothing. Please make sure the clothing is roomy and comfortable. If they struggle with the clothes even after you've tried the break-in process. Some pets just don't want to be dressed, so please DON’T FORCE. Amber realizes that her health is very important. Here, she visits her Veterinarian, Dr. Mona Boord, who specializes in Dermatology. Amber urges all pet owners to seek veterinary care on a regular basis. Aside from loving, feeding, playing and pampering our pets, we must not forget to groom them. This is an important part of your pet’s life. Both dogs and cats should be brushed daily and they also need regular bathing. 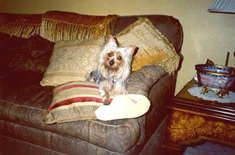 It is essential to familiarize your pet when they are very young with water and shampooing. Also, nail trimming, brushing their teeth, ear cleaning and if necessary, clipping their haircoat. Scheduling standing appointments (and keeping them) with a reputable groomer is the best way to ensure proper pet maintenance. Dogs and cats are animals of habit and the earlier they learn the grooming process, the better for them and you. 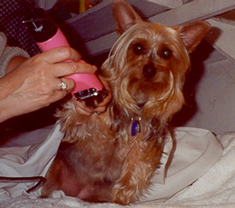 Before their first grooming experience, discipline your pet for a "daily brushing/combing time". Also, get into the habit of brushing your pet’s teeth. These tasks should continue throughout the lifetime of your pet. Remember, your pets are YOUR responsibility and they are dependent on YOU for all of their needs. From time to time we will be offering grooming tips, so keep checking in for the latest and greatest news on grooming techniques, equipment, etc. All artwork, styles, images, verbiage, and poetry are copyrighted and are the property of Amber's Armoire and may not be reproduced without permission.